Emacs comes with a package called EasyPG, with which GnuPG based cryptographic operations become seamless. It can operate on regions as well as files. It also provides good dired and mail-mode integration. Commands such as find-file and save-buffer on any *.gpg file will be dealt with by EasyPG automatically. You can customise this behaviour by modifying the epa-file-name-regexp variable to any pattern you wish. It is Emacs after all. GnuPG is GNU’s implementation of OpenPGP standard. In the post Data encryption with GnuPG, I covered how to use GnuPG in detail. Make sure to check it out if you are not familiar with GnuPG. EasyPG commands all start with epa-, most of them are pretty self-explanatory. E.g. epa-encrypt-region encrypts a marked region in the current buffer. EasyPG uses symmetric encryption by default, which will ask you to set a password when a new .gpg file is saved. The encrypted file can then be decrypted using the same password. If you prefer public-key encryption with added security, instead just save file with C-x C-s, you can use epa-file-select-key to get a list of keys in your system and select the recipient’s public key for encryption. Sensitive information such as usernames and passwords for online logins, software licence keys and financial figures should be kept secret. They should be stored with a disaster recovery storage strategy in case of data corruption or hardware failure. One accessible method would be putting them in a plain text file, encrypting the file and then throwing it in Dropbox or a git repository, and then you can forget about it. Org-mode is unbeatable for organising notes and simple tabular data in plain text files. Saving the file as passwords.org.gpg, you will be asked to either set up a password for the file or select the recipient’s public key for encryption - depending on your EasyPG settings. In this use case you are the sole ‘recipient’ of the encrypted message - why would you want to share all your passwords with anyone else? Tips: make sure you choose a strong password ONLY for encrypting the password list, and don’t use it anywhere else. If you prefer public-key encryption, use strong and unique passwords for each private key as well. With epa-encrypt-region you can encrypt sensitive sections of a file and share the rest of the document with others. E.g. sharing your notes on how to setup a computer but not the license keys of applications. Imagine you need to share the below project plan with a colleague. Toggle the outline mode, it still looks nice and clean. It’s always a good practice to encrypt sensitive info even you are the only one who will ever read it, otherwise it can easily lead to embarrassment, identity fraud or more devastating disasters if your computer is compromised. Having to type the password in every time when you open a file can quickly get tedious. 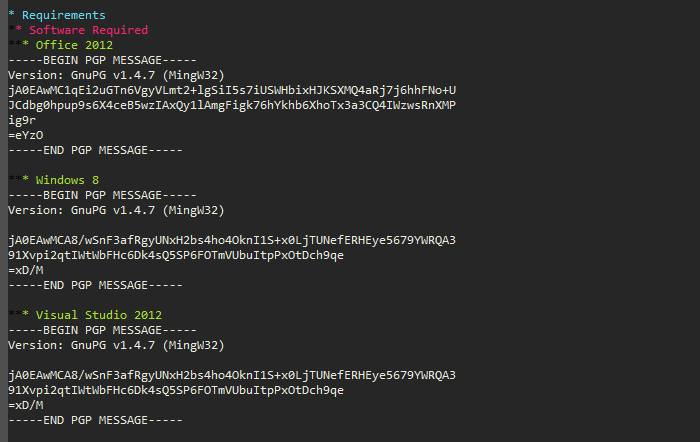 Fortunately GnuPG provides an utility called gpg-agent which can cache passwords for a pre-defined period of time. EasyPG can remember your password for symmetric encryption. Credentials caching can get complicated depending on which version of GnuPG you have in your system and the encryption methods your employ. It’s best to consult relevant documentation for detailed instructions. The added bonus is now that Emacs will cache the password for a short period of time automatically without a GUI pinentry.